Home Handladdning Hylspreparering Smörjmedel REDDING IMPERIAL SIZING DIE WAX-2 OZ. REDDING IMPERIAL SIZING DIE WAX-2 OZ. Imperial Sizing Die Wax was developed in the early 1970's, and it has been popular with precision reloaders ever since - look in any shooters reloading box at a benchrest match and you will find a tin. Reloaders like Imperial because of its extremely high lubricity and ease of removal. 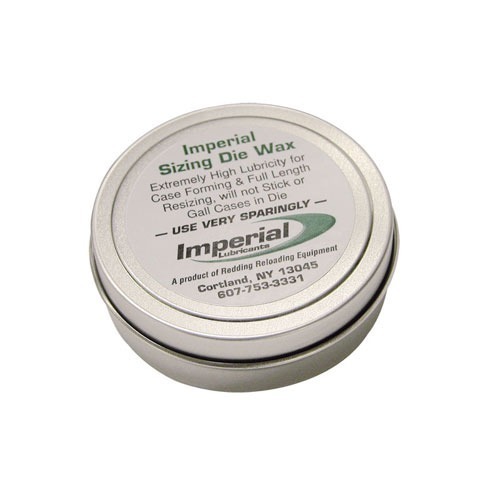 Full length sizing and forming the toughest wildcats is made easier with Imperial Wax. Cases are easily wiped clean with a paper towel. Comes in 2 oz. Kundernas betyg påImperial Sizing Die Wax-2 oz. It is ten years since I started using Imperial die Wax for case resizing, and I can thoroughly recommend this product. It is the only case lube I've used that sizes fired cases using a small base die, where the case does not jam in the sizing die. I hope it never goes out of production. Great product with no bad points. I leave it sitting right beside my press and dab my finger on the wax before picking up a case. As I'm feeding the case into the shell-holder, I make sure it has a light coating on the body and neck. I also smear a bit on the case mouth every 2nd or 3rd round to ensure the inside of the case necks get lubed. This stuff is very easy to use, and you can just wipe it off with a dry rag when you are done. I see my tin lasting me 15-20 years. Well worth the money. Just like the other reviewers said, just dab your finger in the tin and smear a little bit on your case. Cases slide right into the die smoothly every time. Wipes off easily with a rag. A little goes a long way, so one tin should last for thousands of cases. No pad to mess with or messy spray. Tin is very small and doesn't take up any room on the bench. Try it, you will like it! I am new to reloading but have already tried a few products for lubing brass before sizing. This product works perfectly. Just slide your finger across the wax before grabbing the next case and rub the case as you put it into the press. You can also rub some into your palms and lube a large amount of brass by mixing the brass with your lubed hands. I prefer to do it one case at a time because it is so easy and the results are excellent! One can will last a long, long time! I use this very occasionally when I full-length resize my .204 Ruger cases. I struggled along with lube pads etc and found this stuff to be a life changer. A very small amount on the fingertips is all you need to provide a barely visible layer of lube to each case. Cleans off very well. I tumble my brass before sizing, and again after sizing to remove lube, but maybe not required, a rag would do. I also use the Redding powdered graphite for the inside of case necks. Buy both of them together - a must have. While I haven't used a whole bunch of other lubricants, I can verify that this Imperial works more than excellently. While sizing 300 blackout cases, I can get about 3 cases up into the die after initial finger application with ease. I really wouldn't go much more than that depending on how much is used. I've sized probably about 2-4000 cases and still have about 80% of the was remaining if not more. Pretty impressive. The only disadvantage is removing it. Since I don't tumble after sizing, hand removing gets to be a bit of a chore. Other than that though, it's great stuff. I just finished full length resizing 100 30-'06 cases and it was a breeze! This stuff is just great. Just put a little on your index finger and smear it on the neck and case body--just enough so that if feels greasy. Hardly ANY force is needed on the up or down stroke and you're done! Really it's that easy. I'm using a regular Redding full length die with a Redding carbide expander button. The press is a 45 year old RCBS Rock Chucker. Previously with this set-up I tried to full length resize using another competitor lube and it was a horrible ordeal which ended in a stuck case! So I was thought that I might need a bigger press to do 30-06. After reading all the glowing reviews for Imperial Die Wax, I figured that it was worth trying. Try this lube, you will not be disppointed. Absolutely effortless resizing and easy cleanup with a rag. The imperial wax works beautifully for full length sizing cases. Just a little dab on ones index finger is enough to cover the case. Applies a light film of lubricant and the cases slide thru the die like never before. I have two of the 2 oz. cans now so I never have to run out of my new case lubrication. Very nice product and easy to use. I know folks who swear by this stuff and they probably use Hoppe's #9 as well. Might as well have come over on the Mayflower. Bought to expand some 6BR cases to 30BR. I used the K&M expander that is purpose made for this task. Lubed up the case and the mandrel with this mess. Nothing doing. Case refused to expand. Sprayed case and mandrel with Hornady case lube. 5 minutes later i had expanded 50 cases. That pretty much says it all for me. Tillverkarens produktnummer: 07600 611760076008 Imperial Sizing Die Wax utvecklades i början av 1970-talet, och det har varit populärt med precision reloaders någonsin sedan - titta i några skyttar omlastning låda på en benchrest match och du hittar en burk. Reloaders gillar Imperial på grund av sin extremt hög smörjförmåga och enkel borttagning. Full längd dimensionering och bildar den tuffaste wildcats underlättas med Imperial vax. Fall lätt torkas ren med en pappershandduk.